So the Tour of Cali kicked off today. The big euro-pros hare in town, but I hope that our domestic boys can add tot he mix. There was a little drama with Rock Racing and I think that they mishandled the situation by lettting the roster issue stick around till the last min. That said, I'm starting to like Mr. Ball a little more. I watched him address the press and while he is a bit of a maverick, and while he over used the phrases "first and foremost" And "period", I think that he is genuine in his intentions to improve the sport of cycling. Velosnooze has the interview here. For those that care, you might notice that I've dropped the moniker "Old Balls", while calling myself "Dr. K" is a bit pretentious I don't think that old balls is appropriate any longer. 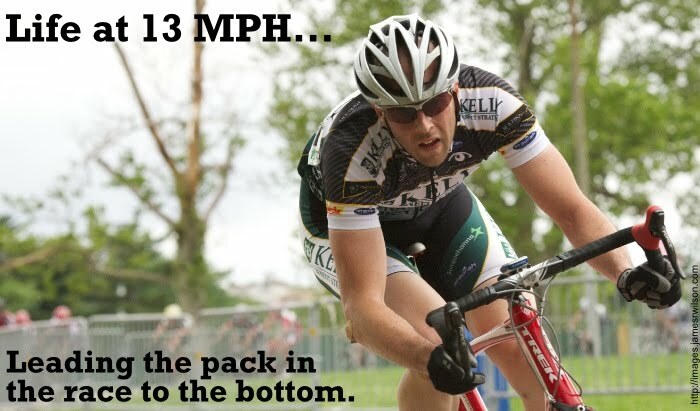 The new group I'm riding with has a large contingent of riders 5-10 years my senior, and they are faster than me. Case in point this weekend, new teammate and fast man Rick Norton put me in the hurt locker. About 2.5 hours into the ride after some nice rotating paceline riding we start climbing. The pitch increases as the climb progresses and eventually it is just him and me. I'm starting to pack up and decide to sit on. He flicks and in my state of oxygen debt I blurt out "I'm just gonna sit", his response, "OK". Then my lizard brain realized that that was the biggest mistake I could have made. I could literally hear the countdown...3...2...1...boom. Rick stood up, accelerated and left me clawing after his wheel. Needless to say I could not match his acceleration and blew up pretty hard. All in all it was a good ride and getting handled from time to time is a good thing. In other news Sean "sweeper" Keefer was visiting his chica in B-more this weekend. We had lunch today, and he filled me in on the haps and the craps back in C-U. I't is gonna be a bit strange not being with the Illini kids (and other MWCCC peeps too) this weekend at OSU. To those there, have fun at the races. I'll pray for warmer weather that usual. Yo, thanks for keeping the MWCCC kids in mind. You're going to have to pray REALLY hard, though! Hehe. Hope things are going well back east. Apropos, back east, there's a chance I'll be moving to DC this fall. I'm interviewing for positions there as well as in the Bay Area; it looks like it will be either one or other. So it'll be cool to keep up with your endeavors in the mid-atlantic this year. Stay in touch, man!